Floor coverings are usually the first building materials to get wet during a water damage. Different types of floor coverings require different cleaning methods but the common rule for all floor coverings salvage is an immediate action and dry out. Tiles are the most water resistant flooring material. If well installed, chances are that water didn't drip and no damage is caused to the sub flooring. To verify that water did not damage the sub floorings you can remove a few tiles and touch the sub flooring or you can schedule an infrared inspection to detect moisture under your tiles without removing them. To clean tile floor, simply scrub and wash the floor. You may also want to consider rinsing the floor to remove all mud, dirt, and debris. This technique will also clean the tiles grout. More often than not, water will drip under a loose section of linoleum or vinyl. In this case, linoleum or vinyl floor may trap water in the sub floors underneath, leading to additional damage. To allow the sub floor to thoroughly dry, carefully remove the floor to allow air to circulate. To speed us this process, you can utilize additional dry out techniques or hire a professional. Hiring a restoration professional is recommended if you want to try and salvage as much flooring material as possible. The use of professional equipment, combined with the knowledge and experience will promote better results. After assuring that the floor is completely dry, clean it with regular cleaning materials; scrub out dirt, mud, and debris, and wash to remove soap and other cleaning materials. 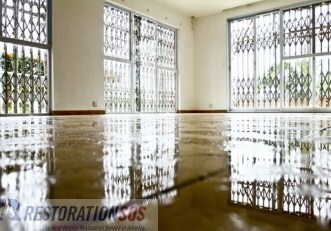 As you address water damage caused to your floor, keep in mind that sub flooring must be dried out fast as well. This task often requires removing the floor to allow sub flooring to thoroughly dry out. Long submersion may loosen adhesives and warp sub-flooring and if not treated immediately, the sub flooring will have to be replaced. This fact is most important when the sub flooring is made of wood. If not treated in a timely manner, the wood will buckle and wrap.